Plants would be mostly red yellow, or even violet. Similar to M Stars but with a few green. Most of plants would be green like on the earth, but in autumn, for example, they could back red or yellow. Plants could be light blue, or green, a few white. Plants couldn't grow because the DNA as we know would be destroyed by the powerful source of gamma rays. Life is so hard to grow into binary or multiple systems, but plant would maybe absorbe black, or violet. The color of the sky would be of any color, but if the composition of the atmosphere it's similar to earth's atmosphere it would be from orange, yellow, white, to blue, like you can see here. No, plants are green because they reflect more green light. Colors should be completely opposite! 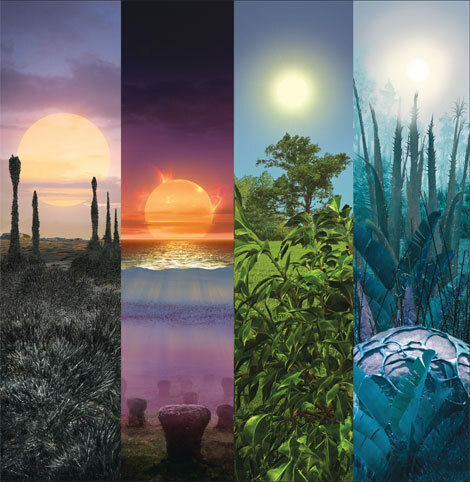 The first two is of a red dwarf's biosphere (the second one is under shallow water to protect against UV flares), the third is a Sun-like yellow dwarf's, the fourth is a white star's biosphere. Blue giants and WR stars cannot biosphere, because their lifetime are just a few tens of million years. We don't know that. There are about as many planets with life around them in binary and multiple star systems as there are in single star systems (actually, maybe a little more for single star systems). Sure the presence of multiple stars would make it challenging, but not too hard to grow. If anything, a multiple star system could provide a wider range of spectrums for plant analogs to work with. Also, I know of an article somewhere that talks about this kind of thing. I'd have to find it later. In SpaceEngine, yes. But this is a thread about the real world. I was trying to make a point that while we do have an idea of the conditions, for all we know, life could evolve just as easily in a binary as it would around a single star system when the conditions are right. for all we know, life could evolve just as easily in a binary as it would around a single star system when the conditions are right. And for all we know it could be much more difficult. We just don't have enough information to make any statements of certainty on the topic. Which is pretty much the point I was making since the OP stated that it would be harder when we don't really know for sure. Anyways, in one of the articles that I listed, it's unlikely that plants will be blue, although looking at the black body thing, it could appear around red dwarfs or K type stars which don't radiate much in the blue spectrum. If I'm understanding the whole thing right. Also, I remember from that article, which I believe that image SpaceEngineer posted is from, that plants around white stars could also appear silvery. For A class stars, they might live long enough for life to evolve, but life might not get very far before the star dies. A class stars usually only live a couple hundred million years, maybe up to a billion? Not exactly sure the maxiumum lifespan for A type stars. SpaceEngineer, what article is that picture from? That may have been the article I was thinking of. I founded this post on a forum, could a planet orbiting a red dwarf or a white dwarf have different brightness? Edit: SpaceEngineer, what article is that picture from? Just a note, plants are just a branch of the eukaryotes that came into existance here on earth by coincidence, but at that time had a good chance of survival so that it spread and evolved all over the planet. Yet it is a small group of organisms compared to microscopic life. I highly doubt we will find plants or even animals on any alien planet. I expect something truly alien, something that evolved out of alien equivalents of eukaryotes. That doesn't mean it can't look like us, we have many beneficial traits like brains, muscles, hands etc. that would possibly be beneficial for life on any planet. I highly doubt we will find plants or even animals on any alien planet. I expect something truly alien, something that evolved out of alien equivalents of eukaryotes. Even if it doesn't have DNA it would still end up classified as an animal because its overall function would be like that of an animal.